These high-power national acts are great bands and popular with many corporate and private clients. These headliners bring with them a wealth of experience and talent that will not disappoint. This band is an established national dance/show band. They have a non-stop program of theme shows, high-energy dance music, and loads of audience participation. 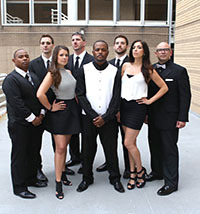 Their repertoire ranges from Motown to Rock and can fit into any thematic climate. They consist of singers, dancers, and musicians and are a complete entertainment package for your special event. They come in 3 sizes, 20, 12, and 8. 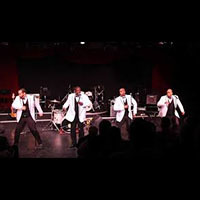 When it comes time to get the party started, this Motown Cover Band is the perfect choice for wedding and corporate entertainment. They have an interactive flair that will keep your guests entertained from beginning to end. Motown, Rhythm and Blues is their specialty and they will keep your guests dancing 'All Night Long'! Their performing credits include the NBA All-Star Game, the NHL All-Star Game, The Democratic National Convention, Microsoft, Fortune 500 companies, and hundreds of satisfied wedding clients. 'Fun' and 'exciting' are words that have been used to describe this band. Their youth and energy are intoxicating as well as their authentic lead vocals. Re-creating the excitement of the best dance music for all genres is just part of what makes them the perfect dance band for your biggest, and most important events.